Dormont is THE name when it comes to gas and water hoses, connectors, and valves in the foodservice industry. For over 60 years, Dormant has set the standard for gas safety. Their history of innovation and emphasis on safety, plus their continual attention to the needs of the industry, allow them to meet your needs. Since gas and water are often the life-blood of a commercial kitchen, you need to know that you can rely upon your connectivity. Dormont provides you with that peace of mind so you can focus on running your foodservice establishment. Dormont Gas Hoses are stainless steel tubing and weaving, sealed with an antimicrobial PVC coating. Dormont Connectors and Fittings rotate to reduce stress at connections. 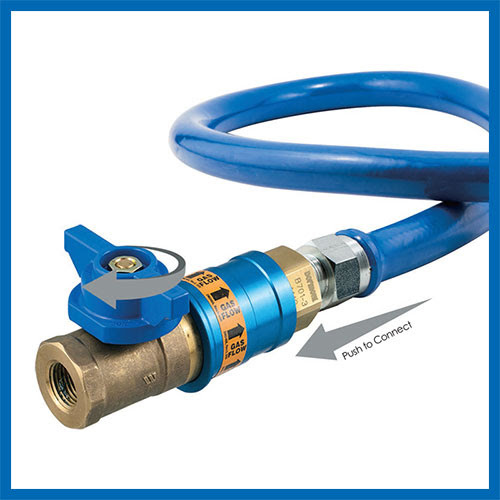 The Dormont Blue Hose is a moveable-grade, braided, blue PVC-coated, 304 stainless steel commercial gas connector. This innovative gas hose utilizes a patented Stress Guard® technology which incorporates rotational fittings at both ends of the hose to reduce stress when connecting moveable or caster-mounted equipment to a gas source. 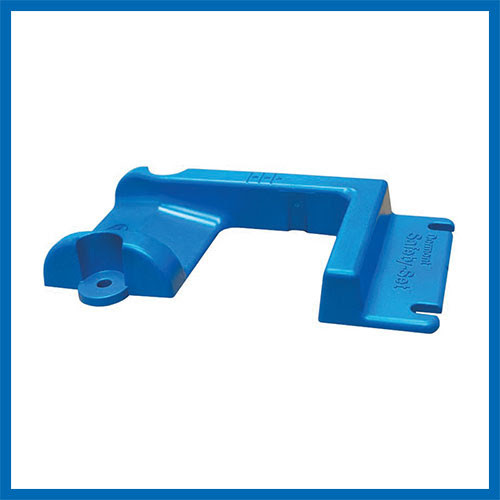 These end fittings are formed from carbon steel and zinc trivalent chromate for incredible strength. The internal tubing is constructed from annealed, corrugated 304 stainless steel for optimal strength and performance. Over the tubing, a multi-strand, stainless steel wire braiding adds another layer of strength and flexibility, preventing the corrugated tubing from stretching out over time. Dormont's trademark blue PVC coating is antimicrobial to improve cleanliness, even in non-optimal sanitary conditions, such as behind equipment or when exposed to grease splatter and dust. For increased safety, the coating melts at 350 degrees Fahrenheit and will not hold a flame when exposed to a fire source. The Blue Hose is available in a variety of fitting sizes ranging from 1/2" to 1-1/4". Note that the Blue Hose is designed for indoor use only and has a maximum operating pressure of 1/2 PSI. For peace of mind, trust the Dormont Blue Hose for efficiency and safety. 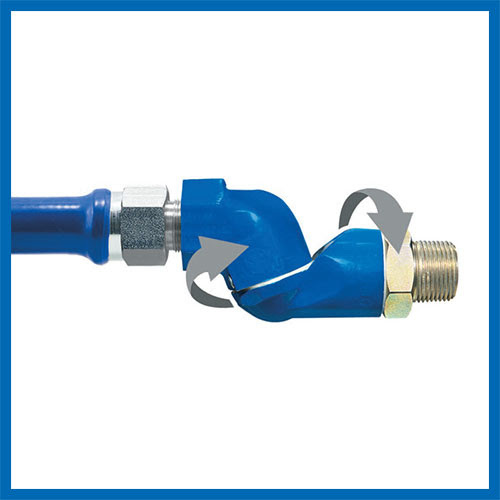 The SnapFast is a Quick Disconnect Fitting for gas hoses and is ideally paired with Dormont's Blue Hose. The fitting has a durable, heavy brass body and an aluminum collar. Dormont designed this fitting for a quick and safe one-handed disconnection for easier maintenance and cleaning. Built into the fitting is a thermal shutoff module which shuts off gas flow when internal temperatures exceed 350 degrees Fahrenheit. Consider SnapFast from Dormont for safer operation of your gas equipment. The SnapFast assembly is available in fitting sizes ranging from 1/2" to 1-1/4". 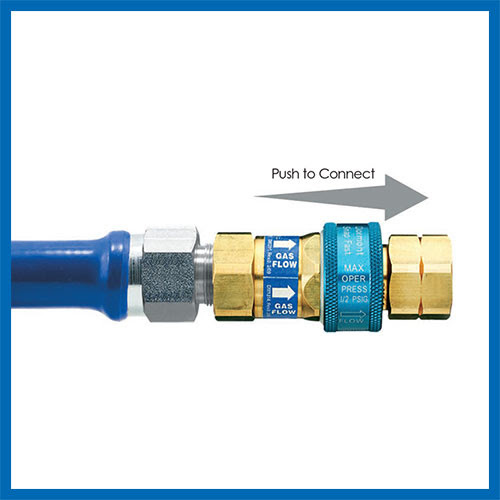 The Safety Quik is a quick disconnect fitting for gas hoses such as the Blue Hose. It combines a one-handed quick-disconnect feature with a protection valve. The fitting is constructed with a durable brass body with a flat face that you push to connect with one hand for easy install and maintenance. Dormont keeps the focus on safety with its unique protection valve. If the fitting is not connected to a hose, the full-port brass ball valve cannot be rotated to an open flow position, which increases your safety and protects your business from a potential disaster. In addition the fitting cannot be disconnected from a hose or gas source while gas is flowing. The Safety Quik valves are available in fitting sizes ranging from 1/2" to 1". The Swivel MAX from Dormont is a 360 degree, multi-plane rotational fitting for gas hoses. Providing a full rotation allows the hose to move more freely with a reduction in stress on both the hose and the fittings. The swivel action also means that you can position your gas equipment closer to the wall and on either side of the gas source for an increase in installation options and mobility. The fitting has a solid, aluminum body and the rotational fitting is formed from plated steel. Available in fitting sizes ranging from 1/2" to 1-1/4". Replaces most rigid street elbow connectors. Can be paired with a SnapFast or Safety Quik quick-disconnect fitting. The Safety-Set is a durable floor bracket-style positioning system that allows gas equipment to remain in place or to be returned to their original position without fear of rolling. It is composed of a flame-retardant Polycarbonate/ABS injection molded thermoplastic blend. With the Safety-Set secured to the floor (by thumb screw hardware or adhesive foam tape), commercial kitchen equipment that is installed on stands with casters or that is itself mobile will not be easily moved from its designated location. Ideal for keeping cooking equipment under ventilation systems. The Safety-Set also keeps potential fire sources directly beneath fire suppression systems. Compatible with 4", 5" and 6" casters.